Villa d’Este is considered one of the most beautiful architectural works of the sixteenth century. Designed by Pellegrino Pellegrini called “Il Tibaldi”, famous architect of the time, it is surrounded by a private park with centennial plants where you can admire the Nympheum by Pellegrino Pellegrini, the Hercules Fountain and the Telemachus Statue. In its halls you can admire fascinating works of art including some from the French school, others from the Canova school and decorations by Andrea Appiani. Villa d’Este inaugurates its 146th season on March 8th. Villa d’Este opens for Christmas time to celebrate the Millennium with sumptuous gala dinners, masked balls and shows. A Beauty Center is open and the following year an underground passage which connects the Sporting Club to the Beauty Center and the Cardinal building is open too. In 1999 Villa d’Este also buys Villa La Massa, the Florentine Hotel. The Sporting Club is inaugurated along with the floating swimming pool, the first floating pool on Lake Como. A group of wealthy Milanese businessmen purchase Villa d’Este and open it as Luxury Hotel. 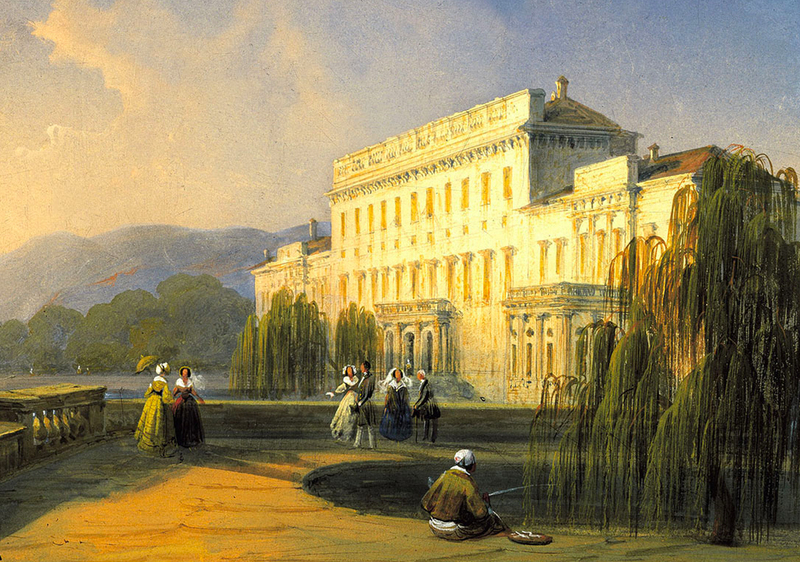 Baron Ciani builds the Queen’s Pavilion in honour of Caroline of Brunswick and opens it up to the public as a SPA. Villa d’Este is then leased to the Russian czarina Maria Feodorowna. When Caroline of Brunswick dies, Prince Torlonia becomes the owner and, after a period of abandonment, Prince Domenico Orsini succeeds and later on Baron Ciani. Caroline of Brunswick, Princess of Wales, makes her royal entry. She changes the name of Villa Garrovo in New Villa d’Este (later simply Villa d’Este.) It’s a glorious moment for the Villa. When the Marquis dies, his wife, Vittoria Peluso, a former ballerina at La Scala, inherits the Villa. She then marries Count Domenico Pino, a Napoleonic general and builds fortresses for him so that he can stage mock war battles. These fortresses can still be visited. The last heir of the Gallios sells the property to Count Ruggero Marliani; after the Count, the Marquis Bartolomeo Calderara becomes the owner. After the Cardinal death, the House of Gallio reigns here for nearly two centuries. The architect Pellegrino Pellegrini builds the Villa as a summer residence for the Cardinalof Como, Tolomeo Gallio, who names it Villa Garrovo after the stream that flows into the lake.